Don’t let winter stop you from training! The COBRAS have entered into agreements with Inspired Training and The Fast Lab to provide highly discounted training sessions for Honorary and Active COBRAS members! 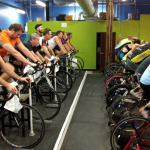 These are not “spin” classes but real training sessions using your own bike on a Compu-Trainer. Click on either name above for the details. 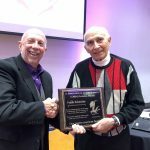 COBRAS Celebrate 25 years and honor their founder Frank Schneider. The COBRAS cycling team was founded in 1993 by Herman Ponder, an accomplished racer, and Frank Schneider, a beginning racer as a developmental/racing club focused on individuals who love the sport of cycling and who already race or are interested in learning to race. The 2018 COBRAS Annual Banquet Photos have been posted! Thank you to Keith Renninson for contributing many of the photos! The photos can be found here. 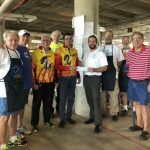 COBRAS member Jim Leach presented Cliff Brewer, Event Director for Davis Phinney Foundation for Parkinson’s and Margaret Tennant, an active cyclist who suffers from Parkinson’s a donation of $500 from the COBRAS during our annual road clean up today. Thank you to all the COBRAS members and friends who came out today and participated in the COBRAS Annual Road Clean up! 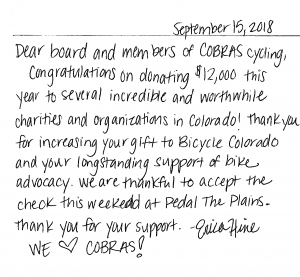 The COBRAS received this very nice note from Erica Hine, Membership Manager at Bicycle Colorado. Thank you, Erica, and yes, the COBRAS proudly support Bicycle Colorado, Bike Jeffco, Project ReCycle, Craig Hospital, the Davis Phinney Foundation, Bicycle Racing Association of Colorado and the Cancer Fitness Institute. 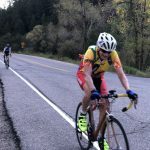 Congratulations to all the riders who participated in the 2018 COBRAS Deer Creek Hill Climb! It was a great day, beautiful weather, the course was clean and the traffic was light! It doesn’t get much better! Click here for the results. Photos of the DCHC have been added to the Photo Gallery. 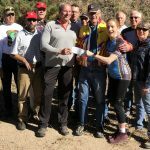 COBRAS Present Bicycle Colorado with a donation of $1,000.00 at the Pedal the Plains event in Limon CO. David Hunter, president of the COBRAS and Larry Potter, Treasurer had the pleasure of presenting Piep van Heuvan, Policy Director for Bicycle Colorado our donation. COBRAS donate funds to Project ReCycle. 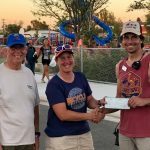 COBRAS president David Hunter along with COBRAS treasurer Larry Potter presented Project ReCycle’s executive director Jon Buck a donation from the COBRAS for $500. 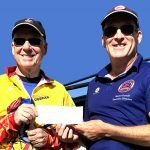 COBRAS Donate funds to Craig Hospital. 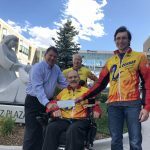 COBRAS president David Hunter along with COBRAS members Craig Seaman, Hans Schulze and Larry Potter presented Michael Fordyce the President and CEO of Craig Hospital a check for $500.00 on behalf of the COBRAS. This was both a joyous and humbling experience to be able to take part in this event and see the work that Craig hospital does. Unfortunately, a fair number of Craig Hospital’s patients are cyclists, including some COBRAS members. The COBRAS are proud to be able to contribute to the work that they do. This year the COBRAS have donated $12,000.00 to various charities and bicycling advocacy groups. 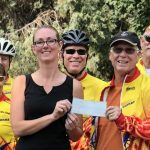 COBRAS/KHMTT present BRAC with a check for $7,000.00 to support bicycle racing in Colorado. 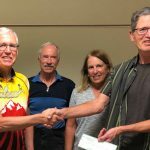 Larry Potter, the treasure of the COBRAS bicycle racing club presented Shawn Farrell, the Executive Director of the Bicycle Racing Association of Colorado (the local USAC association) with a check from the proceeds of this year’s KHMTT. The COBRAS are accepting new members! Now is a great time to join the COBRAS, keep active on the bike with our weekly rides! Racing and non Racing members welcomed! It’s easy and you can join online today! Just click on JOIN COBRAS for more information. COBRAS on Strava! COBRAS president David H. has created a Strava group for the COBRAS. Several members have joined in the past month. Your Strava stats can be downloaded and compared to our teammates in COBRAS. Sign up here and have some fun. Come join us on a Saturday ride! Our club rides are open to members and non-members as well. You can receive notifications about our rides by signing up for our weekly Club Ride Notices. Lost or forgot the COBRAS Member only password? You can get it instantly using the Password Request Form. Is your information up to date? The COBRAS are automating our membership list and you can find it here. Take a look and be sure your information is up to date. If not, you can correct it here. Follow us on Facebook! You can find it at COBRAS Facebook page. Give us both a Like and Follow Us! Also be sure to invite all your cycling friends to like/follow our Facebook page. Looking for a mid-week ride? We have posted our team ride routes to the web site that you can download and follow. Go to Route Collection and enjoy! Many thanks to GREEN MOUNTAIN SPORTS 12364 West Alameda Parkway Lakewood, CO 80228 303-987-8758 for their sponsorship. The COBRAS are proud to announce our new sponsor Rudy Project! For more information, click here!